Wei Min specialises in cross border corporate and commercial transactions, mergers and acquisitions and private equity, and regulatory compliance. She has extensive experience in advising on legal and compliance issues in foreign direct investments in all sectors and works closely with clients on practical solutions. She is also experienced in private client work involving trusts and foundations (family and philanthropic). She also advises on the use of such structures for commercial and restructuring purposes. Wei Min headed, on behalf of Zaid Ibrahim & Co, the law reform project undertaken by the Labuan Financial Services Authority which resulted in the successful passing of the current suite of the laws of the Federal Territory of Labuan, Malaysia in 2010. She continues to be involved in law reform projects. 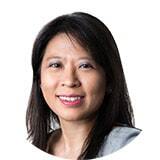 Wei Min is a director and approved trust officer of ZICO Trust Limited, a Labuan trust company licensed by the Labuan Financial Services Authority, and a director of ZICO Allshores Trust (S) Pte Ltd, a Singapore trust company licensed by the Monetary Authority of Singapore. Wei Min commenced her career in 1995 as a legal practitioner with major Singapore law firms in Singapore. She joined the ZICO group in 2000.